Buccaneers running back Bobby Rainey was held to 37 yards on 20 carries against the Rams on Sunday. Two things are understood after Sunday: Robert Quinn is a force, and the Tampa Bay Buccaneers’ offense is bad, bad, bad. The Bucs saw a winnable chance come and go with a thud at the Edward Jones Dome. Sure, the St. Louis Rams’ talented defensive end snatched the spotlight after turning Mike Glennon into his personal rag doll. But in so many ways, this was an uninspiring effort by Greg Schiano’s team. It was inane. It was inexcusable. It was inexplicable. The best news? There’s one more game left in this silly season. Give thanks for that. 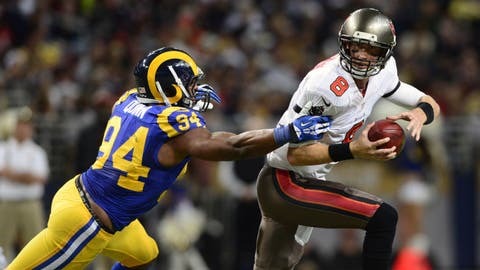 Mike Glennon was sacked 7 times as the Buccaneers struggled on offense yet again in a loss to the Rams. It was easy to see why the promising third-year player was the center of conversation for the Bucs all week. He entered with an NFC-high 15 sacks and ranked second in the NFL, behind Robert Mathis’ 16 1/2. He’s fast, agile, a beast off the edge, and Bucs offensive linemen had their hands full trying to slow him. His final line: six tackles and three sacks, one of which provided a fitting end to the afternoon. Fortunately for the Bucs, Quinn plays outside the NFC South, so this terror won’t preoccupy them each year. Still, the Bucs caught a glimpse of one of the league’s elite young talents. He’s as good as advertised. 2. The Bucs’ running game struggled â¦ again. If you’ve followed the Bucs this month, you’re probably asking yourself this: What else is new? Entering Sunday, Bobby Rainey was held to fewer than 65 yards in three of his last four starts. He found running to be rough again against a formidable Rams defensive line before finishing with 37 yards on 20 carries. Overall, this was another dreadful performance by the Bucs’ offense. They produced an 11-play, 85-yard scoring drive in the first quarter but finished with 85 yards the rest of the way. When Glennon wasn’t being sacked, he looked overmatched at times. Not good. What more needs to be said? This is a team that wants to run first to set up the pass. The Bucs failed again, and they lost because of it. 3. Zac Stacy dented the Bucs’ defense. The Rams appear to have found something strong with Stacy. The rookie running back had 104 yards on 33 carries, his second consecutive game with at least 100 yards rushing after he gashed the New Orleans Saints for 133 last week. The Bucs clamped down later in the second half, but Stacy’s impact already had been felt. The Rams enjoyed Steven Jackson’s physical services in the backfield for so many years. Perhaps Stacy can grow into a similar role in time. 4. The Rams left some points on the field. Credit the Bucs for pouncing on the gifts, but the Rams fumbled their way to some unnecessary, uncomfortable moments in the second half. Leading 14-7 in the second quarter, St. Louis curiously thought Kellen Clemens would be the best option to run into the end zone from 2 yards out. Instead, he fumbled on the draw, taking away a sure-fire 14-point lead. Of course, little about this sequence mattered by the end. It goes to show that the Rams could have routed the Bucs much earlier instead of icing the result with a 48-yard field goal by Greg Zuerlein with 3:20 left in the fourth quarter. The Bucs were fortunate to be in the game late in the second half. Even with the help, though, they failed to capitalize . not exactly a new development. 5. The Bucs missed an opportunity. This was a winnable game in one of the least intimidating venues in the NFL. Sure, St. Louis has a strong defensive line, led by Quinn’s fierce talent. But this was a bad day for so many key areas of the Bucs’ offense: Glennon, Rainey, the entire line. Outside of the Bucs’ first scoring drive, this "attack" strained to do much of anything. It’s hard to defend offensive coordinator Mike Sullivan. He’s not getting the job done. It’s safe to say that if he receives the Army position, most Bucs fans won’t miss him. One more week to go. Let this sad crawl continue.